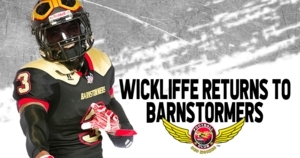 Wickliffe (6-1, 205, Eastern Illinois University) returns to the Iowa Barnstormers for his second season with the team and his third season with the Indoor Football League (IFL). Wickliffe first joined the Barnstormers in 2018 where he appeared in ten regular season games. Wickliffe finished the regular season with 50.5 total tackles, 2.5 tackles for loss, three interceptions, six pass breakups, two forced fumbles, and two fumble recoveries earning his place on Second Team All-IFL Defense. Wickliffe also contributed to the Barnstormers’ United Conference Championship and United Bowl Championship victories.